I’m usually not the hiking type. Walking to my corner shop or to the pub is usually about as far as I’ll venture by foot on any given day – but everyone now and then I feel a yearning. I feel the need welling up inside my very being to return to a very specific area and to get lost for a few hours, leaving behind my worries and all the people that cause them. 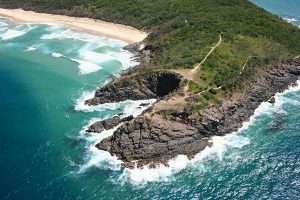 Of course there are many places to get lost on the Sunshine coast, with its beautiful and picturesque national parks and breathtaking beaches – but it’s hard to beat the legendary Noosa National Park and all her natural, and stunning treasures. The area definitely lives up to its hype, and it keeps dragging me back for more. I don’t even mind all the walking. Not far from Noosa’s Main beach lies the edge of the massive 4,000 hectare nature reserve complete with a number of fantastic walking trails of differing difficulty, length and scenery. 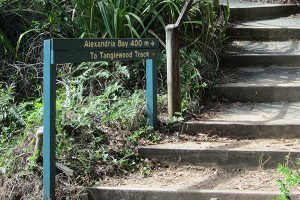 During this particular visit I took on the 4.2km Tanglewood Track through the lush rainforest with its thick tree canopy – complete with the soundtrack of native bird song, and crashing waves from the flanking coastline. I take particular joy in this auditory juxtaposition as it combines two incredibly different, and equally beautiful worlds in a joyful and almost spiritually refreshing symphony. The track itself starts off near to the entrance to the park, and quickly begins its gradual incline towards its climatic heights deeper in the park. This isn’t a particularly difficult walk, and is definitely doable by the everyday-man – if leaving him a little breathless at times. At its higher reaches the track begins to brighten as the tree canopy opens up to invite it more rays of sunlight with views of the beaches further below. At this point, the track is flanked mostly by tall gums and thick ferns – stylishly decorated with what looks to be “swing-quality” vines – although my wife refused to let me channel my inner Tarzan upon their discovery. The track then continues to wind its way towards the Alexandria Bay area. The bay announces itself well before coming into view with its roaring, percussive sounds created by crashing waves on its sandy and rocky shores. 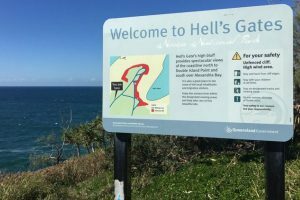 It truly is quite an experience – the sounds alone are enough to inspire both awe and fear to accompany the “no swimming” warning signs. The track then continues on towards the forebodingly named “Hell’s Gates”. Here you can experience the infamous blowhole that really should not be skipped. 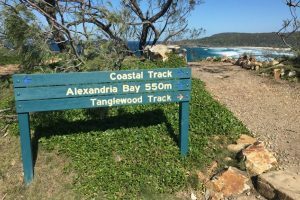 At this point in the trail you have come to its furthest reaches and are met with a tranquil retreat offering seating and a chance to relax and reflect surrounded by the power of the ocean – on one side the roaring power of Alexandria Bay, and the tranquillity of Laguna Bay on the other. Once you’ve taken it all in (and caught your breath and calmed your heart rate if you’re anything like me) you can take the Coastal Track back to the entrance to the park. 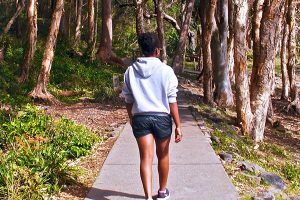 This walk is much easier, and offers a completely different scenery – winding its way along the breathtaking Noosa Coastline. The final stretch is truly reinvigorating and will leave you with an incredible sense of accomplishment at its culmination. For all you need to know about our parks, visit the QLD Government website.